Fair warning. This post is rather shallow. Or reflects shallowly (word?) upon me. I’m rich in all the things that count. 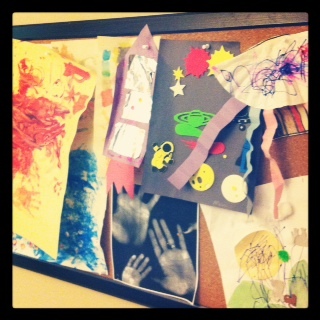 Like family, friends and toddler artwork. Priceless art created by genius toddler. Of course. I live in a beautiful (if still somewhat dated) home in the ‘burbs. It’s a nice kind of ‘burbs…with mature trees, winding trails and beautiful parks. Walk through my neighbourhood and you’ll trip over a park every five minutes. Certainly, I do not lack for a good life. However, I’m no billionaire. Or thousandaire even. What I am is one badass hundredaire. I don’t mean I’m swimming in Benjamins. I mean that my dollars are earned and spent in equal measure. I did mention I live in a somewhat dated home. That means renovations here, there and everywhere. But enough about house renovations – as rewarding as they are. This here post is focused on the trivial and is meant to be of little depth. I’ve come to the conclusion that my Pinterests boards make a mockery of my hundredaire status. Yes, I know…if I saved up my pennies for a rainy day…blah-dee-blah-blah. I have no patience for rainy days. What I really need is a quick-rich scheme…obviously. But I’m a hundredaire who is also a realist. Which is why Pinterest fulfills that shallow part of my character that covets pretty, fashionable things. Fulfilling or not, I covet thee leather boots and skinny jeans; shaggy carpet laid upon rich, caramel hardwood; yes, nicely organized home office, I covet thee too. Pinterest is where I keep my virtual wishlists. It’s the perfect If-I-had-a-million-dollars kind of picture journaling (said in BNL sing-song voice). I’ll never be rolling in the dough. Nope. Not in this life. But I can roll out some Pinterest boards chock full of awesome. Now come on, fess up. Do you have a Pinterest account? If not, why? If you do – let’s be Pinterest buddies so we can live out our badass hundredaire lives together shamelessly coveting ‘That Which We Do Not Need’! This: Pinterest is where I keep my virtual wishlists. It’s the perfect If-I-had-a-million-dollars kind of picture journaling (said in BNL sing-song voice). I will commit to banana bread and up Karen one bowl of homemade potato salad 🙂 I think this sounds like a potluck in the making….What time should be be there Mel? I’m a hundredaire too!! It’s nice to find a compatriot. I always say Pinterest is like a fake other world. I called it shameless coveting. Pinterest is ridiculously addictive. I told my friend who was new to the concept that Pinterest is all the things I would do or buy if I had endless amounts of time, talent, and money :). My reality is pretty darned great but Pinterest is a fun little vehicle for my dreams! We’re of like minds, Stef. Of like minds!